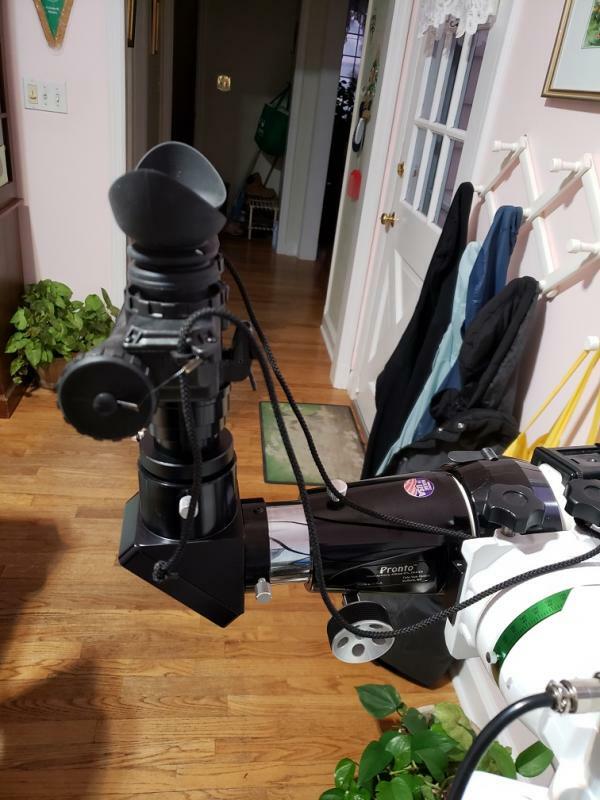 I recently purchased an item entitled " GSO 2" 0.75x Focal Reducer for Ritchey-Chretien RC Telescopes"; however, I wasn't interested in trying it out with my RC-10. Instead, my Takahashi Sky 90 was the targeted scope. I started afocal observing with my NVD Micro with this telescope and the TV 55mm Plossl. The wide field (4+ degrees) and low f/2.7 gave a pleasing view but it wasn't perfect. At the very edge field curvature was having its effect and I soon became addicted to f/2 and faster from the camera lenses that I was beginning to use. To make the story short I will cut to the chase. The new reducer with the 55mm and 2" 12nm H-alpha filter provides a whopping 5.87 degree FOV at f/2 with stars sharp to the edge. I framed the Heart and Soul nebulae together with space surrounding for an incredible view. This arrangement totally fulfilled my wish and the fit and finish of the reducer rival the TV and A-P products that I own. I can now look at wide swaths of nebulous sky with plenty of sharp stars included. I'm a happy camper. I think it is so phunny that in the rest of the astronomy community it is aperture, aperture, aperture, and here we are using tiny little telescopes and making them as fast as we can!!! Excellent news that you have achieved such an excellent field of view! I use a 2” .7 reducer with my 102mm F5 and 120mm F7.5 refractors as well as my F11.5 Mewlon 210 and also like the results. I observe at prime focus and screw the reducer into the bottom of the 1.25 to 2” adapter that came with my 2” diagonal. I was out last Thursday and logged 26 nebulas with the 102mm refractor at f3.5 with the .7 reducer and a 6nm Ha filter including my best view of the Heart & Soul and California Nebulas and the brighter section of Bernard’s Loop among many others. Which reducer you use at prime focus? Thx. I have a 1.25" Rini reducer (labeled .5, but actually .7) from Telescope Warehouse and at a first test on my Televue Pronto 70mm F6.8 refractor it works visually but it has not enough infocus for my PVS-7. I tried it before and after a 1.25" diagonal. I did not try a 2" diagonal thinking that it would make the optical path even longer. The new reducer with the 55mm and 2" 12nm H-alpha filter provides a whopping 5.87 degree FOV at f/2 with stars sharp to the edge. I framed the Heart and Soul nebulae together with space surrounding for an incredible view. I take it you are threading the reducer to the bottom of the Plossl, with filter on the front of the reducer? I threaded the optical element of the reducer ( it comes with an extension that I did not use) to the 2" diagonal. I threaded the filter to the bottom of the 55mm Plossl thinking that I would switch it over to the reducer if things didn't look just right but everything was grand so I just left it that way. As usual, this new setup required me to adjust the diopter setting of the Micro - quite a bit this time actually. As you might expect, I was very pleased to see the reducer countered the field curvature I had experienced with the Plossl alone. I was hopeful this would occur since that is my experience when I used the A-P 0.75X photo-visual reducer on my RC-10. I should add that this is such a beautifully packaged product it came with a 2" to T-2 adapter for the optical element. I will probably use this to attach it to my Baader Silver T-2 diagonal to get a bit of focal reduction in the RC-10 for the largest globulars that I observe. I use a Antares .7 2" reducer that I purchased from ScopeStuff. HERE is a link. I tried .5 reducers in both 2" and 1.25" size and they did not work, too much in-focus or too much visual edge distortion. Some 2" diagonals have a long light path. The Astro-Physics 2" diagonal is the best one that I have found. If you go that route, make sure you get a 1.25 to 2” adapter to use with the 2” diagonal that has a short barrel and that the end of the barrel is of course threaded for 2” filters so you can screw on the reducer. The above works with my Micro but I can't say if it will work with a PVS-7. I do not have a PVS-7 just a NVD Micro. To work at prime focus I use the 2-inch AP diagonal along with the 1.25 to 2" adapter that comes with most 2" diagonals. I screw the 2" .7 reducer into the bottom of the 1.25" to 2" adapter that comes with 2" diagonals (for using 1.25-inch eyepieces with a 2" diagonal) NOT on the front of the diagonal. Then I just insert the Micro into the 1.25" to 2" adapter just like using a 1.25 inch eyepiece with a 2" diagonal. So its: telescope, then focuser, then 2" diagonal, then 2" .7 reducer screwed into the bottom of the 1.25" to 2"adapter, then that combination is inserted into the diagonal, then the Micro is inserted into the 1.25" to 2" adapter (with the reducer screwed onto the bottom) just like an eyepiece. Edited by bobhen, 28 January 2019 - 02:54 PM. My mistake, you mentioned indeed that you have a Micro. Your 2" to 1.25" adapter must be different from the ones that came with my 2" diagonals, which are quite flat and would not have space for a reducer on one side and the NV device on the other. Thanks for taking the time to explain. Wow, very nice report. Do you know roughly how much in-focus is needed with this reducer in use? I have the GSO 2" 0.5x focuser, I have it reduced to around 0.7x by adjusting the reducer to NV distance. I wonder how the GSO RC reducer would compare to my current setup. Lastly, did you notice much image vignetting with reducer & 55mm Plossl in place? Edited by moshen, 30 January 2019 - 12:46 AM. It would be helpful if the focal length of the reducer was known but I couldn't find one published. I have on my own deduced it must be about 500 mm - exactly in between my CCDT67 and 27TVPH AP reducers. I have assumed this GSO optic probably has about the same backfocus as the CCDT67 which gives me an approximate backfocus for my setup of 120 mm. Plugging these numbers into the equation (500-120)/500 yields 0.76 which is the stated reduction factor for the optic and makes sense to me. The beauty of the TV 55mm Plossl is that it requires so much out-focus that it balances out the in-focus requirement of the reducer. My whole setup comes to focus with ~15 mm of travel left in the focuser. 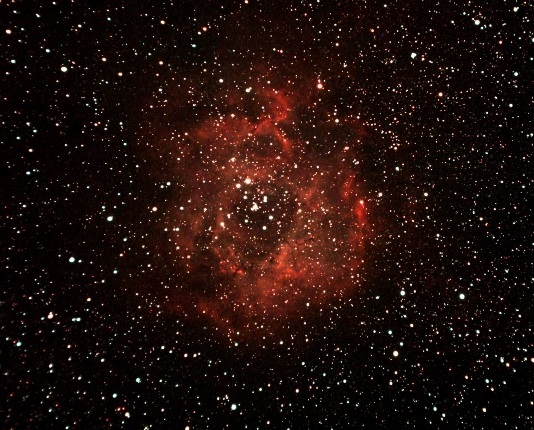 There was no vignetting visible - just beautiful nebulae and stars. Interestingly, the last region I viewed that night was Alnitak to the Great Orion Nebula. It was stunning to see in real time the Flame, Horsehead and M42 gloriously displayed. In fact, I was taken back mentally to a Tony Hallas/Daphne Mount image that I had seen years ago of the exact same region. They used an AP Traveler with Pentax 6X7 camera and the image just mesmerized me. Now I can see the same thing in real time. Agena Astro Products has a dozen or so different brands and most astro shops carry them as well. Get one with a low profile or short barrel and one that is threaded on the bottom so you can screw in a 2" reducer. Also make sure that when inserted completely the set screw is high enough so it does not hit the 2" diagonal. Also, The Astro-Physics 2" diagonal has a short light path and that is the one I use. Chemisted, this is a nice find. I had to look up the GSO 2" 0.75x Focal Reducer for Ritchey-Chretien RC Telescopes to see what it looks like. A few months ago, I read a post by someone using a Meade .63x reducer made for SCTs, but it was being used successfully with a refractor. With this report, it sounds like these reducers made for specific types of scopes can sometimes be crossed over for use with refractors... good news. What made you try this particular reducer? Or, why did you think it would work with your Sky 90? I use an Orion .8x reducer with my refractors and it does a pretty good job. It was my familiarity with the AP reducers that I have owned for a long time. 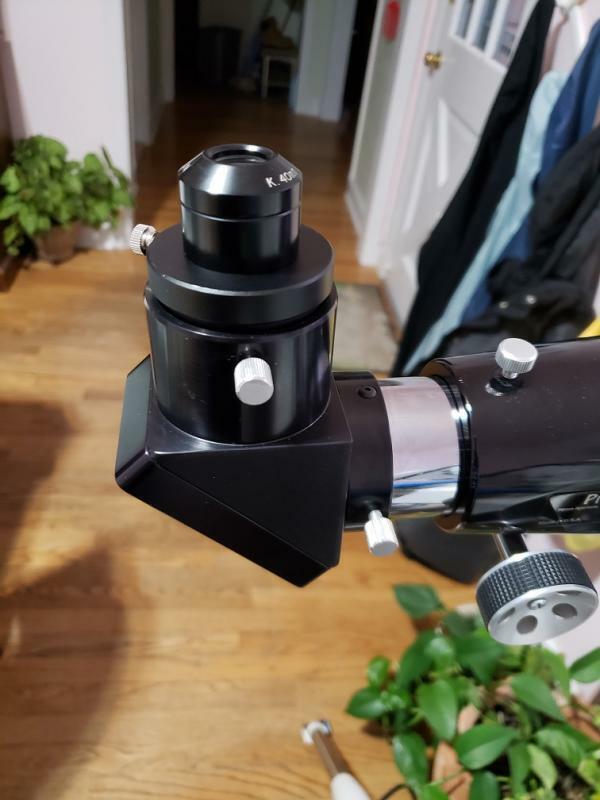 The 27TVPH was designed for the f/5.8-7.5 refractors that they have made over the years and has always performed wonderfully with RC telescopes in general and my OGS RC-10 in particular. I was hoping the reverse would be true for the GSO reducer and this seems to be the case at least for my Sky 90. I would be interested to hear if others can get similar results with other smallish refractors. I have found that the Meade F/.63 Reducer/Corrector works with my Astro-Tech AT60ED APO refractor. With my ASI294MC camera, I get a FOV of: 4.84 degrees x 3.3 degrees. Feast your eyes on this full frame of the Rosette Nebula, taken with my ASI294MC camera, UHC filter and UV/IR block filter. 24x15s subs, SharpCap 3.2 Pro, processing on the Fly, no post processing. I have a deposit on a 6" f/8 refractor, hoping for a spring delivery. This purchase was not for NV, but I will definitely try it out! Well, just for the record, the sequence focuser-> 2" diagonal (Televue Everbrite) -> .7 Antares 2" reducer screwed into the bottom of a Blue Fireball 2" to 1.25" Eyepiece Adapter (# E-07 at Agena Astro) -> PVS-7 with 1.25" eyepiece barrel , does not work with the Televue Pronto (70mm F 6.8). Although the PVS-7 sits really low into the adapter, the infocus travel is still not sufficient, by quite a bit I estimate. The setup however works visually, at least with the 40mm eyepiece that I tried. I have now ordered a 1 1/2" extension tube for 2" eyepiece, in order to try to insert the PVS-7 directly with the 2" step of the C-adaptor housing instead of the 1.25" barrel, and I hope to gain around 21 millimeters of infocus. So the sequence would be focuser-> 2" diagonal (Televue Everbrite) -> .7 Antares 2" reducer screwed into the bottom of a 1 1/2" extension tube for 2" eyepiece -> PVS-7 with the 2" step of the C-adapter. I will get back with the results. Chemisted, how are you attaching the NVD for afocal use? I plan on getting a Meade 56mm plossl to try with my Baader digiscoping adapter. I originallly only experimented with the adapter attached to a Hyperion zoom. It was a neat trick being able to twist the whole adapter with NVD attached but still, of course, only increased f ratio. How do you overcome stray light between plossl and NVD also? The Hyperion zoom had a twist up eyecup with hole just the right size to wrap around my envis lens and block out any light. Do you use the eyecup of the plossl or some other method? I exchanged a few offline messages with Cnoct who said that the mechanical connection of the Novagrade adapter to the EP is good, although of course the EP can still be pulled out accidentally (my own interpretation/summary not his words). I just received the T2 adapter from Rafcamera and I will order the Novagrade kit shortly. 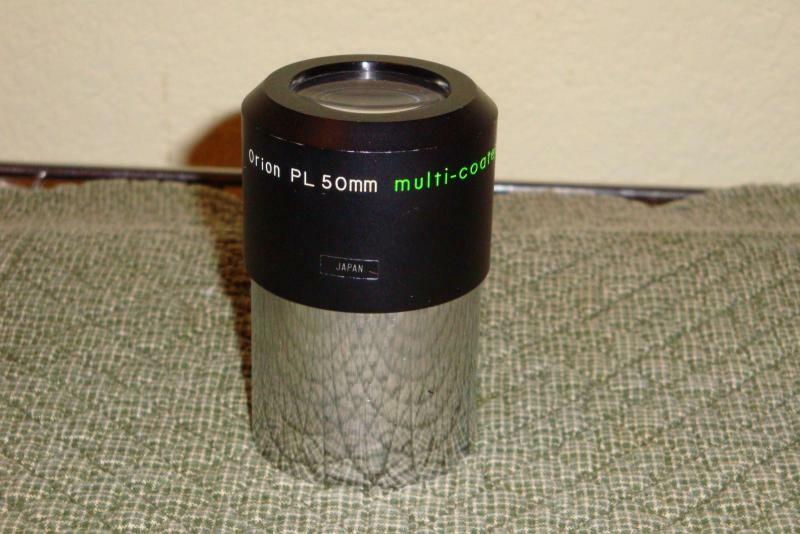 I also found a very inexpensive used 50mm Plossl 2" here on the CN ads, to try in addition to the variety of long FL 1.25" eyepieces I already have. Edited by DMala, 11 March 2019 - 05:31 PM. much neater attachment than the digiscoping adapter. Von, I use the TNVC/TeleVue adapter (sold by TNVC) with my Televue 55mm Plossl. This adapter only works with certain TV eyepieces so it wouldn't be any help with the Meade. Also, I have no experience with the Meade and wonder if it has the same gigantic out-focus requirement that the TV Plossl has. It is this specific feature of the TV 55mm Plossl that counteracts the in-focus requirements of reducers and allows my whole setup to come to focus. None of the other eyepieces that I have (and I have quite a few) can accomplish this feat.